Nvidia's Shield is complementary to gaming consoles for now, but the company hopes that wide adoption of Android gaming ultimately could make the US$349 handheld an alternative to Xbox and PlayStation. The Android gaming handheld has a 5-inch flip-up screen and a built-in controller with a range of buttons. Shield will ship this month and is just $50 cheaper than Sony's upcoming PlayStation 4, which will become available this holiday season. The Xbox One is due to ship later this year with a $499 price tag. With different gaming experiences, Shield for now is not intended to compete with gaming consoles, but will be an alternative to gaming on mobile phones or tablets, said Tom Petersen, director of technical marketing at Nvidia. Gamers who typically buy consoles also play games on PCs and smartphones, and Shield could appeal to that audience. But Shield in the future could become an alternative to consoles as gaming on Android gains popularity and graphics hardware improves, Petersen said. Android is being widely adopted, there is a growing gaming developer base, and titles will be less expensive in Android stores, Petersen said. "If Android gaming continues to get better -- that's our goal and that's what we're spending a ton of money to do -- the differentiation of a console becomes less and less. Sooner or later you're going to hit this inflection point," Petersen said. Right now Android games are mainly for tablets and smartphones, and as the first dedicated Android gaming device, Shield opens the doors for developers to bring console-like graphics to titles on the OS. "We're going to continue to refine Shield. This is our first-generation Shield. It's probably the case if we have moderate success with this then we'll continue down this path," Petersen said. Shield has a quad-core Tegra 4 processor, which has 72 graphics cores and can handle video at a resolution of 3200 x 2000 pixels. Nvidia's on-chip graphics capabilities are among the best in the industry, with a main competitor being Imagination Technologies, whose PowerVR graphics processors are used in many mobile chips. Another competitor is Qualcomm, whose Adreno graphics is optimized more for mobile graphics and long battery life than high-end gaming. Nvidia is selling the console directly to consumers. Smartphone and tablet gaming is growing, but handheld consoles such as Sony's PlayStation Vita have not done well. Nvidia's initial expectations from Shield are conservative, targeting specific audiences such as users of its graphics cards. But it will continue to develop the gaming hardware to improve the graphics experience, and work with developers to write games. "As the Android software gaming environment builds out, you'll see a lot more [buyers]," Petersen said. Nvidia is using Android as a way to regain position in the gaming market. Nvidia's graphics chips were used in the Xbox 360, but the company lost out on the latest gaming consoles to Advanced Micro Devices, whose x86 CPU and Radeon graphics processor are in the upcoming PS4 and Xbox One. AMD is now planning a gaming strategy where it will provide extensions that make it easy to port console games to PCs. 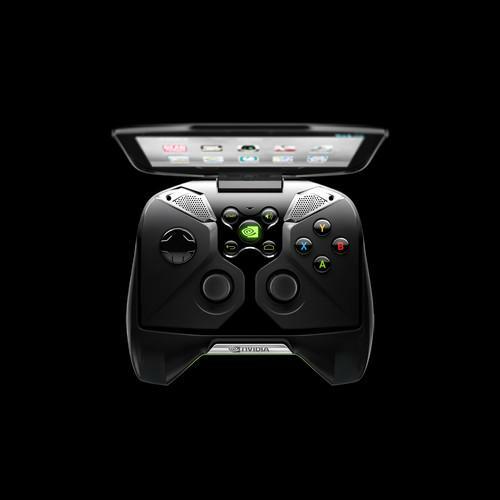 Shield would also be a compelling device for gaming over the cloud, Petersen said. Games initiated and processed in remote data centers could be delivered over the cloud to Shield, much like the device's current ability to receive games from PCs over a wireless network. Nvidia has already announced Grid servers that are packed with its graphics cards to speed up the processing of games in data centers, but the company has not yet linked Grid servers to Shield. Nvidia has also invested in Ouya, which will start shipping the $99 cube-shaped gaming console that can be connected to TVs to play Android games. Ouya is viewed as a low-cost alternative to PS4 and Xbox, and runs on Nvidia's Tegra 3 processor, which has 12 graphics cores. The Shield's Tegra 4 chip offers a superior gaming experience. Shield's 5-inch screen has a 720p resolution, displaying images at a 1280 x 720 pixel resolution. It has Wi-Fi, 16GB of storage and micro-SD for expandable storage. A mini-HDMI port helps stream full 1920 x 1080-pixel images to TV sets. It is also able to run games wirelessly streamed from PCs with GeForce graphics cards. The device, which weighs 579 grams, offers five to six hours of game-play or up to 10 hours of video playback on a single battery charge. Shield can also function as a tablet. Shield will begin shipping by the end of this month. Around 40 to 60 game titles will be initially available for it.